Florissant Police Chief Timothy Lowery and Florissant Valley Fire Protection District Chief Scott Seppelt are happy to announce that their two agencies will be co hosting the annual Public Safety Citizens Academy starting on September 4, 2018. The course will be held every Tuesday from September 4th thru November 6th from 6:30-9:30 pm at the Florissant Police Station or the Florissant Valley Fire Protection District, Fire House #1. 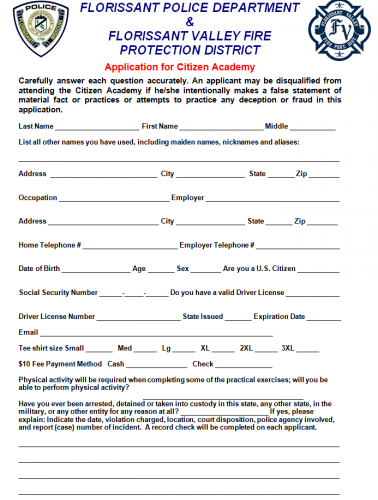 We are currently taking reservations for the next Citizen Academy class. 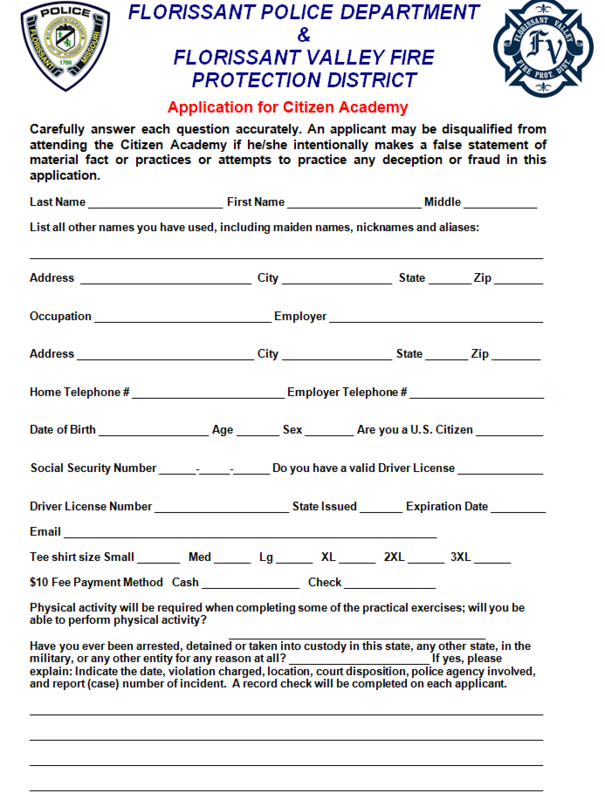 The Academy is open to residents age 18 and over who complete the application process and sign a liability waiver. Anyone interested in attending this class can obtain an application on the Florissant Police Department’s website at www.florissantmo.com under Action Center or call or email Officer Steve Michael at 314-830-6042 or smichael@florissantmo.com. The Florissant Valley Fire Protection District is pleased to announce that we will begin offering regularly scheduled American Heart Association Family & Friends CPR classes. In conjunction with the CPR training, we will offer an optional First Aid & Fire District Information/Procedures Class. This class will briefly discuss how to handle many major medical emergencies and traumatic events, and the Fire District’s policies and procedures in response to these incidents. These classes are available to anyone, but should class sizes become too large, Fire District residents will take priority. Total cost for both classes will be $5, which is solely to cover the cost of the Family & Friends CPR Student Manual. Friends & Family CPR alone will last approximately 2 hours, with the optional First Aid/District Info class lasting an additional 30-45 minutes. Our first class will be offered Saturday May 12, 2018 at 9:00AM at our Firehouse1/Administration Building, located at 661 St. Ferdinand in Old Town Florissant. Please call 314-837-4894 during regular business hours Monday through Friday to register or by email to dkaatman@fvfpd.com or ploeschner@fvfpd.com. We will need your name, phone #, and whether or not you are a resident. We thank you for your continued support, and look forward to the opportunity to continue to serve you in the future.